Unfortunately, I happened to choose to visit Thailand at just about the worst possible time. Although it was supposed to be well-beyond the rainy season, my trip coincided with one of the worst periods of rainfall in years. I’d heard all the warnings in the run-up to my holiday but, ever the optimist, I decided it couldn’t possibly as bad as all that, so went head on into the trip as planned. Turns out, it was as bad as all that. Worse actually. On the first island, I stayed on, the road outside my guesthouse window literally collapsed due to the torrent of water that was flowing underneath the tarmac. Ferries were halted and cars couldn’t get around the island, so supplies even started running out where I was staying. This meant a serious shortage of beer(!) and severely limited food options in restaurants. Not exactly life-threatening, but certainly not the sort of experience of I had been hoping for. Anyway, believe it or not, I’m not actually trying to put you off a visit to Thailand. On the contrary, my trip taught me that there is definitely more to Thailand than paradisiacal beaches and indulgence. I decided northern Thailand would be my best bet for an escape, largely because it was the farthest possible place from the hellish weather. I had no idea what was even available for travelers there and knew even less about backpacking in Thailand, but nonetheless, in my desperate search for sunshine, I jumped on a plane from Krabi to Chiang Mai. In stark contrast to the south, Chiang Mai seemed to be consistently sunny and hot. With my first priority well and truly met, I set out to find my bearings and plan the next phase of my trip. Chiang Mai is an excellent city for tourists, with everything you could want to be packed into the compact, walled old city centre. Fabulous temples can be explored on almost every street, offering some great cultural experiences. The food options are exceptional, with street food, markets, and restaurants catering to all budgets present in abundance. In fact, I would say I ate the most delicious food of my entire trip in a backstreet eatery here. That dish was Khao Soi, a Chiang Mai speciality composed of chicken and fried noodles in a curried broth. 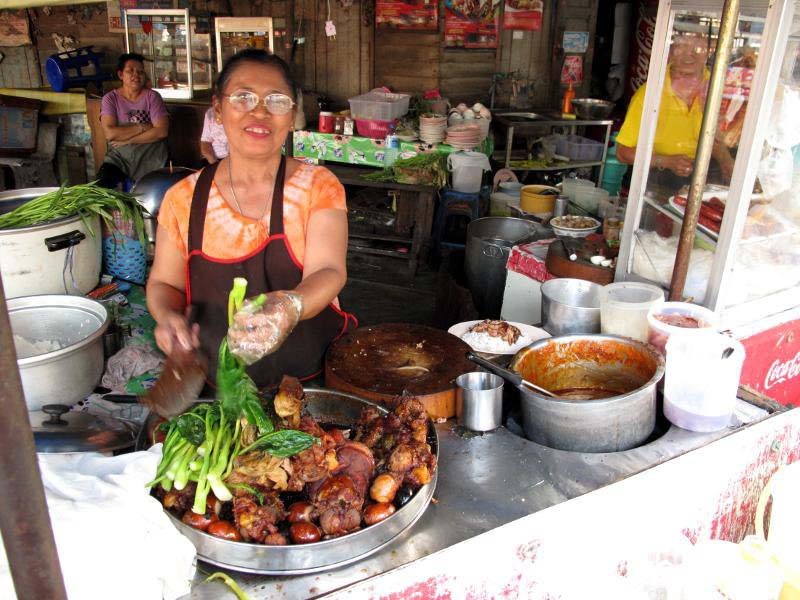 It’s always a great dish, but the little old Thai lady running the little backyard kitchen that I stumbled across had obviously refined the recipe to the point of perfection. And it only cost 30 baht for an enormous portion. I’m sure there are many more hidden gems like this all over the city, waiting to be discovered. Exploring the city’s surroundings is equally rewarding, with waterfalls, more temples, and even Thailand’s tallest mountain, Don Inthanon, within easy reach. My trip up to the Don Inthanon National Park was a definite highlight of my trip, with a stunning temple at the summit of the mountain offering breathtaking views of the of the landscape below. From Chiang Mai, I took the 6-hour minibus on the heart-stoppingly windy road to Pai. This small town has evolved from a tiny village into a backpacker hub, and it was a really relaxing place to spend a few days. There are some great bars, restaurants, and hostels catering for backpackers. Besides hanging out in the town, I took some lovely day trips out on a rented motorbike to see the surrounding area. After a few days, I took another bus via to the small city of Chiang Rai, another classic stop on the northern Thai backpacker trail. While much quieter and less tourist-driven than Chiang Mai, the city has a lot to offer to visitors. I felt that I gained a good insight into northern Thai culture. 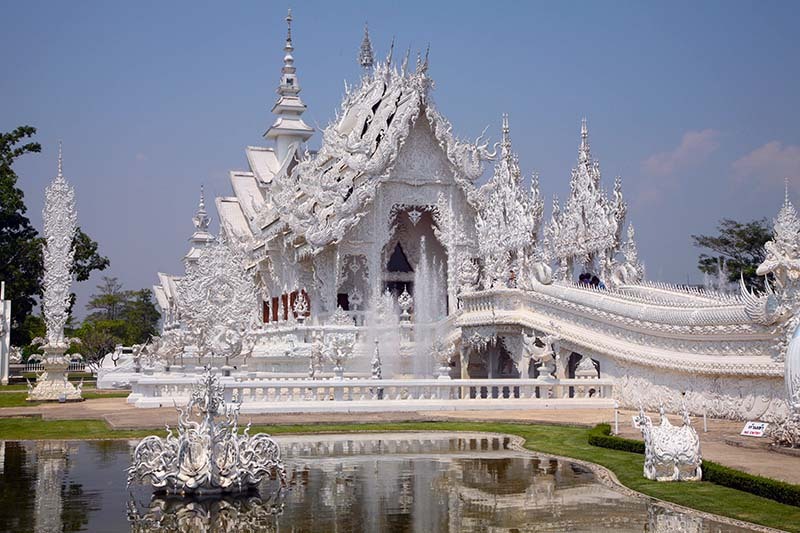 The city has many more temples to visit, including the beautifully dazzling Wat Rong Khun, otherwise known as the ‘White Temple’. 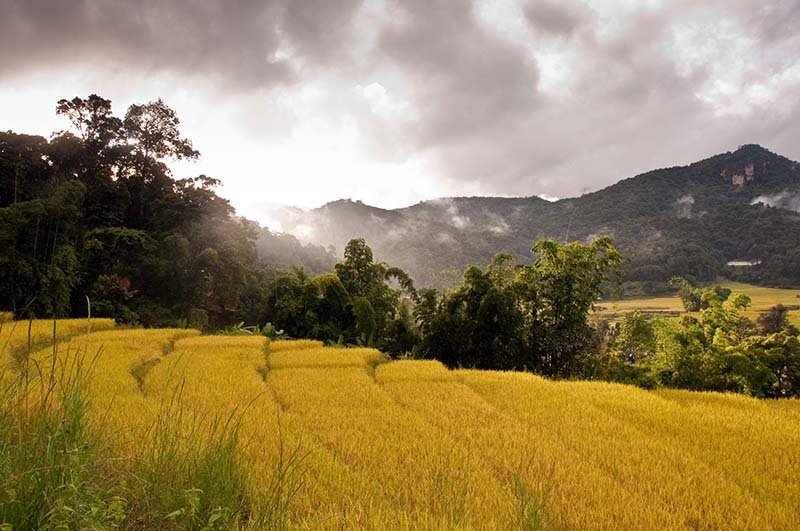 There are also some fantastic museums which help you to better understand the fascinating history of the region, as well as the famous hill tribes that inhabit the remote forested areas of northern Thailand. It was from Chiang Rai that I joined a trekking trip through the jungle, staying in homestays along the way and experiencing the beauty of the exotic jungle on foot. This was an excellent experience that I would highly recommend to anybody and really helped me to see a different side to Thailand. Returning to Chiang Rai, I spent another few days exploring the area by motorbike. I visited a number of national parks, passing through the unique little villages, eating authentic food and getting to know locals. This really helped me to understand a great deal about the area and its people. I eventually ended up in Sukhothai Thani, another northern city that is most famous for its centuries-old ruins. Before I came to Thailand, I had a very blinkered view of the country. I’d only ever heard of the picture postcard beaches, the parties, and the low prices. It turns out, that there is so much more on offer, and by being forced to change my itinerary I was able to have a far more authentic cultural experience than I otherwise would have. My unexpected trip helped me to fall in love with this beautiful country and its people, and I plan to return as a volunteer in Thailand in the near future, in order to give something back.